So sorry to hear of Diane's passing. I was a classmate of hers at MHS, and will always remember her kindness. I was 20 when my Mom passed from this damn cancer, and can only say that it is something that you just don't get over. Just remember that she is in paradise now, and to her it won't seem long until we join her there. God bless. I just found out today about Diane's passing, my sympathies to the families. Another one from the class of 82 gone, she will be missed. I enjoyed working with Diane. She will be missed and was taken from us too soon. My prayers for her family in the days and weeks ahead. Thinking of you Jay, Jayme, Erin & family, wishing you hope in the midst of sorrow, comfort in the midst of pain. Moms stay in a very special part of our hearts even after they pass. We will never forget Diane's smile and zest for life. She will be missed by many as she cared a lot for those around her. My prayers and condolences are with the entire family and wish I could have been there for the funeral today. I remember my cousin Diane best when we were kids playing at Squeak and Bernice's farm. I loved her smile and her outgoing personality. She will be greatly missed on earth, but know she is in heaven with the angels. So sorry to hear of Diane's passing. I very much enjoyed working with her over the years, going all the way back to our Piper Jaffray days. She will be truly missed not only by her friends and family, but also by her peers and her many clients that she so loyally served for many years. We were both blessed to have known Diane. 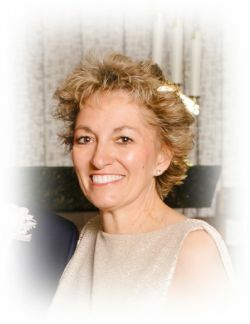 She was not only a wonderful financial advisor, but a wonderful friend as well. We will miss her greatly! I am saddened to hear about the loss of Diane who was my past neighbor, friend and teammate. May God bless you with His peace and comfort during this difficult time.